These plush booths by the contemporary Swiss furniture company Vitra are perfect for a cozy meeting with colleagues when a little more privacy is called for. Named the Alcove Cabin, this high-backed booth creates a room of its own that wraps around you on all sides. This is one line in what Vitra refers to as “Meet and Retreat” spaces in the modern office. In the Business section of today’s Burlington Free Press, I talk about the need to design workspaces like this that are appropriate for both extroverts and introverts. And based on what I saw in Chicago, many of the furniture manufacturers are getting the message. Every company is comprised of individuals, each with their own personalities, work styles, and preferences. So how do we craft one space that meets the needs of such a diverse group? At the recent Vermont Businesses for Social Responsibility spring conference, I led a workshop on designing workspaces to provide a balance between collaboration and concentration, and one of the most compelling questions we heard was how to provide space that is effective for both introverts and extroverts. True extroverts are gregarious, social, and assertive. Extroverts are outgoing and comfortable expressing themselves, and they tend to be good at multitasking and handling large amounts of information at once. However, an estimated 30- 50% of the people we work with are introverts. In general, introverts prefer one-on-one conversations to group activities, tend to think before they speak, and work best focused on a single task with few interruptions. In business, as in life, we need both types of people: those who speak freely and those who think deeply. Studies have shown that the most productive teams are those that combine both introverts and extroverts, and the most effective leaders are those who can bring out the talents of all. The modern office has become more open and fluid to promote teamwork and collaboration but this has introduced challenges for meeting individual’s needs since introverts and extroverts exhibit different work styles and react differently to their physical surroundings. How do these differences manifest themselves in the workplace? One theory is that extroverts excel in the open plan because they thrive from the multiple interactions within one space. They draw creative energy from chance encounters and group collaboration. Introverts, on the other hand, prefer to retreat to a secluded space where they can focus on individual tasks without distraction. An opposing theory claims the exact opposite: that introverts actually work better in an open plan because they have an innate ability to block out noise and distractions. They can shut out their surroundings and look into themselves to accomplish their work. According to this theory, extroverts are at a disadvantage because they are more easily distracted by all of the activity surrounding them. Whichever may be the case, I am increasingly recommending “flexible”, open plans with a mix of spaces to support different tasks and personalities. This concept was evident last week in Chicago at NeoCon World Trade Fair, North America’s largest design expo for commercial interiors. Here, more than 700 manufacturers release their new products each year, much of it based on research related to ergonomics, human psychology, and work styles. In past years, the emphasis was on ‘benching’, long open tables where rows of workers sit side-by-side with no separation. This year, however, the focus was on furnishings and systems that provide greater individual privacy, such as 4-person booths with tall panels that wrap around three sides, and chairs with felt-lined canopies that can muffle a private phone call. Some of these solutions are practical and some are playful, but they all aim to create peaceful spaces that offer visual and acoustical privacy within a louder open plan. This is a clear acknowledgement that workers have varying space needs as they perform different tasks throughout the day, and people perform better in different environments depending on their personality type: introvert, extrovert, or something in between. 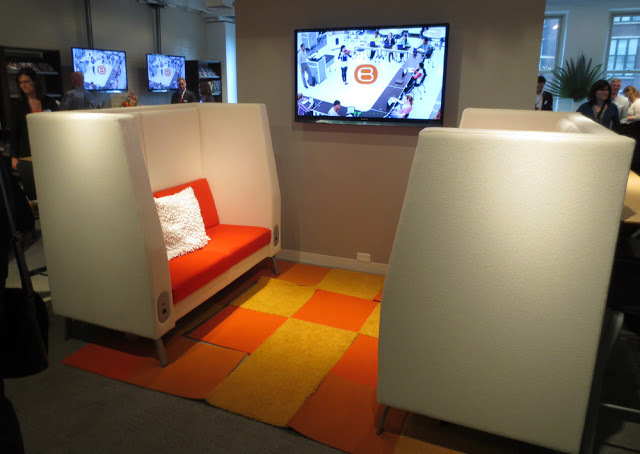 Coalesse, a division of Steelcase, released the Massaud Lounge chair at NeoCon this year. 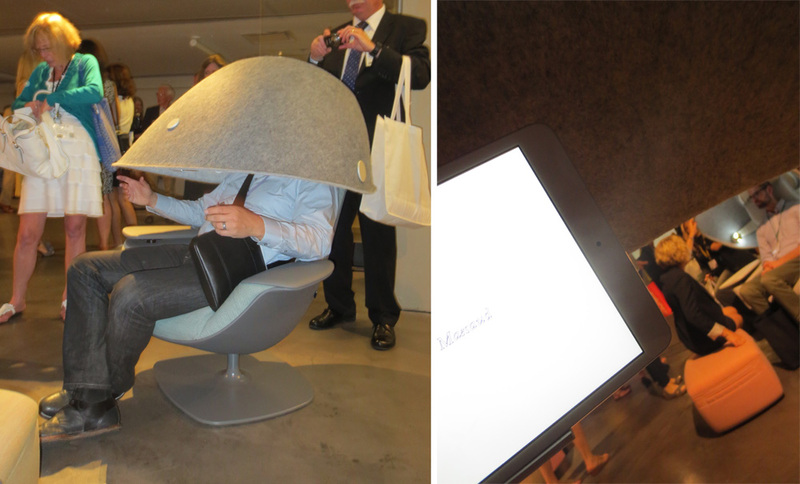 This “privacy pod” features a flip-down hood that masks your vision and voice. Inside, an iPad mounts to the felted canopy for some private facetime or Skype sessions. Another example of space-making for introverts: This high-backed booth by Bretford, where 4 people can meet in relative privacy. The furniture is embedded with power and USB ports for charging your mobile devices.